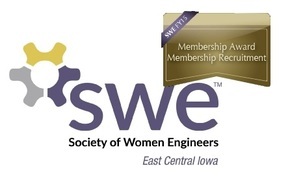 Volunteer with SWE ECI for 'Step into STEM' Activities with Junior Girl Scouts! 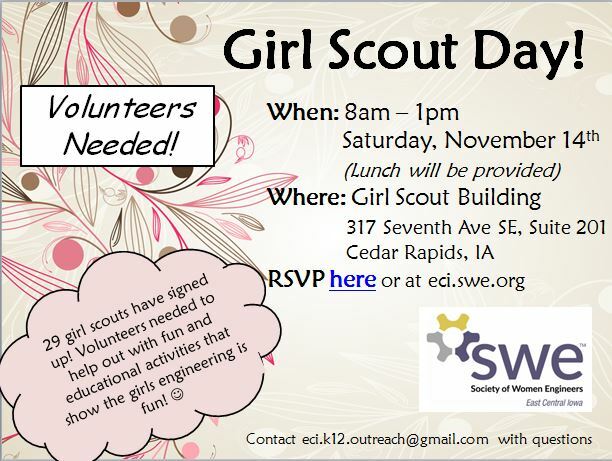 Come volunteer at Girl Scout Day to teach 4th and 5th grade girl scouts about engineering through fun and educational activities. Activities include gum drop towers, motorized kick sticks, glow-in-the -dark super slime, and an egg drop contest. 29 girls have signed up so we could use any and all help we can get! We will give training at 8 a.m. prior to the girls' arrival. Any help is welcome, even if you can't stay all day. Lunch is included at 11:30. ​Please contact Alyssa Reinhardt at eci.k12.outreach@gmail.com if you have questions.